In my ongoing quest to use up that massive pile of pureed sweet potatoes, I hit on the idea of using some of them up in a batch of cinnamon rolls. I tracked down a promising recipe, and after Freyja’s walk this morning, I set to it. They were ready by lunch time, huge and fluffy and sweet, with a barely noticeable sweet potato flavor. Actually, I think the sweet potato puree may have acted in a similar manner to the pudding you sometimes see in cinnamon roll recipes, adding tenderness and moistness akin to that of potato bread. I didn’t make too many adjustments to the recipe: I subbed in white whole wheat flour for about half of the all-purpose, left out the orange zest, and, at Jeremy’s recommendation, made a cream cheese frosting to slather over the top rather than making a sticky bun-type glaze that goes on partway through baking. I would recommend going easy on the frosting unless you were hoping to fall into a sugar-induced coma, because the pecan filling is crazy sweet on its own. I should also note that, although we went to the grocery store yesterday, I somehow failed to notice that I didn’t have anywhere near enough brown sugar or confectioner’s sugar. This gave me the opportunity to try my hand at making both, and it worked out incredibly well. I just stirred a bit of mild molasses into white sugar for the brown, and whizzed up white sugar in my mini-prep food processor to powder it, and both methods worked out so nicely that we couldn’t tell the difference. 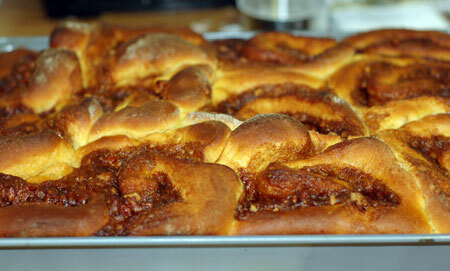 These rolls were delicious, and I would certainly consider making them again next time I make that puree. I definitely got more than 12 rolls from this recipe, though: the dozen I jammed in my 13×9 pan almost rose entirely over the sides, and I put several in a loaf pan also. Still to come: Sweet potato ice cream with wet maple pecans, and me dancing around in glee at having used up the last of that puree (well, you can imagine that second bit). Place first 3 ingredients in a stand mixer bowl, stir to combine, and let stand 5 minutes, unti foamy. Place dough in a well-greased bowl, turning to grease top. Cover with plastic wrap, and let rise in a warm place (85°), free from drafts, 1 hour to 1 hour and 30 minutes or until doubled in bulk. Punch dough down. Turn dough out onto a lightly floured surface, and roll into a 10- x 18-inch rectangle. Spread evenly with filling, leaving a 1-inch border. Roll up dough, jelly-roll fashion, starting at 1 long side. Cut into about 12 (1 1/2-inch) slices, and arrange in a lightly greased 13- x 9-inch baking pan (put any additional slices in a loaf pan). Cover with plastic wrap, and let rise in a warm place (85°), free from drafts, 30 minutes. Bake rolls at 400°F for 17-20 minutes until lightly browned and a wooden pick inserted in center comes out clean. 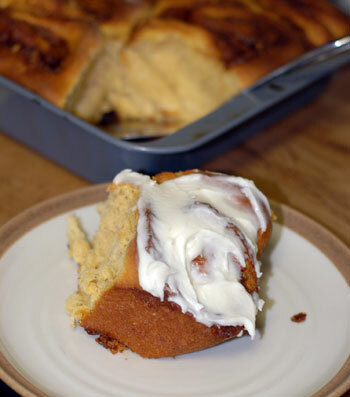 Remove rolls from oven, and let cool 10 to 20 minutes before serving, slathered with cream cheese frosting. Cream the cream cheese, butter and vanilla together until light and fluffy, then add powdered sugar half a cup at a time until frosting reaches desired consistency (about 3-4 cups). Source: Adapted from Southern Living, October 2006.